The David Ortiz traveling road show made it's first stop in Portland Monday, and by all indications and results things went very well. Ortiz finished 2-3 with a walk, an RBI and a run scored in the Sea Dogs 8-2 win. He left the game in the 6th for a pinch runner after blooping a single to right. 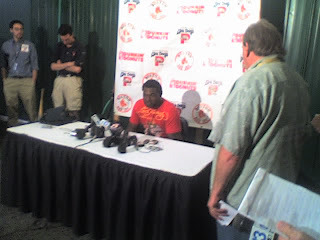 Ortiz put the crowd in a tizzy from the moment he first appeared (tizzy was used as a tribute to a conversation with NESN's Jayme Parker in the press box. NESN made a great choice sending her up here as she and her camera man John were tremendous), and he certainly did not disappoint the capacity crowd. When he was on third base in the first inning, he got a standing ovation just for tipping his batting helmet to the crowd on the third base side. It was quite an atmosphere, to say the least. In the post-game press conference, in which the media managed to brave a small family of skunks who hang out by the bullpen, Ortiz said he felt "100%" and was really using this time to "see more pitches and get my timing right" for Friday's Fenway return against the Yankees. It was quite a big-league atmosphere Monday night, good work by the Sea Dogs Media Relations (Chris Cameron and Jessica Johnson specifically) putting this together fairly smoothly, in spite of the weather and the wildlife. I will be in Foxwoods the next couple of days, but quick-hitters will be posted just like normal. Also all of the recent podcasts, namely Saturday's interview and Sunday's WJZF simulcast, are online and uploaded. Thanks to Talkshoe for working though the technical difficulties. Sorry it took me sooo...long to respond, but things have been hectic. I did however want to thank Matt for the "Tizzy" tribute. That's awesome. I loved hanging out with you guys in the press box.